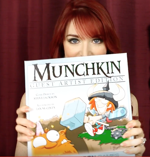 Daily Illuminator: Lisa Foiles Likes Munchkin Guest Artist Editions! May 23, 2016: Lisa Foiles Likes Munchkin Guest Artist Editions! Our friend Lisa Foiles (entertainer, writer, YouTuber, and general awesome person) recently mentioned Munchkin as a great quick and dirty card game. That's awesome. Now she's started a new series, Lisa Likes, where she talks about media, games, and other things that she enjoys. Well guess who made the list? Munchkin Guest Artist Editions! You should have known that, I put it in the title. Lisa gave glowing praise about the art of Ian McGinty and John Kovalic for their renditions of the classic games. Being a long time Munchkin fan, the fact that she enjoys the new artists means a lot! Lisa's channel is great, so if you enjoy this video, you should definitely subscribe. Thanks again, Lisa!